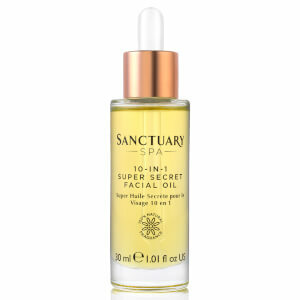 Deliver a nourishing kick to skin in need of a little TLC with the Sanctuary Spa Overnight Replenishing Miracle Oil; a super-rich and indulgent luxurious elixir powered by a blend natural oils that works overnight to rejuvenate your complexion. Suitable for all skin types, the lipid recovery facial oil gets to work on smoothing the appearance of wrinkles with anti-ageing ingredient Juvinity™ whilst Rosehip, Pomegranate Seed and Jojoba oils retexture, protect and promote elasticity respectively. With continued use, the results show a visible reduction in fine lines and wrinkles with improved radiance and tone. Housed in a glass bottle topped with a pipette for mess-free application. Warm a few drops of oil between your palms and apply to clean, dry skin, smoothing over your face, neck and décolletage. Tip: Apply the Lipid Recovery Facial Oil onto the skin & take a few minutes to massage the product over the face, this not only improves the texture of the skin but aids the circulation & lymphatic flow, helping to reduce puffiness. Helianthus Annuus (Sunfower) Seed Oil, Simmondsia Chinensis (Jojoba) Seed Oil, Triticum Vulgare (Wheat) Germ Oil, Rosa Rubiginosa Seed Oil, Caprilic/Capric Triglyceride, Lavandula Angustifolia (Lavender) Oil, Linalool, Punica Granatum Seed Oil, Geranylgenarylisopropanol, Anthemis Nobilis Flower Oil, Citrus Aurantium Amara (Bitter Orange) Flower Oil, Limonene, Geraniol.